For the first half of Part I, Sasuke accompanies Team 7 in its various endeavors and training sessions. 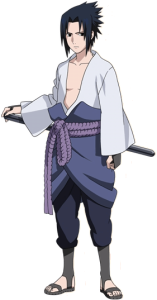 After his encounter with Orochimaru during the Chunin Exams, who begins to manipulate Sasuke into his custody, Sasuke starts to act independently of Naruto and Sakura, pursuing his own opponents and being the only one to train with Kakashi. After Itachi's brief return to Konoha and his simultaneous defeat by him, Sasuke becomes dissatisfied with what he has learned whilst a member of Team 7. Believing Orochimaru will be able to give him the strength needed to kill Itachi, Sasuke goes to him, severing his ties with Konoha in the process. Naruto follows him in an effort to stop him, and the two ultimately do battle. Though he tries to kill Naruto, Sasuke ultimately cannot bring himself to do so, and instead continues on to Orochimaru's hideout, ready to gain strength at any cost. After two-and-a-half years Sasuke, satisfied that he has learned all he can from his new master, turns against a weakened Orochimaru before the latter can steal his body. Though Orochimaru attempts to force a body switch, Sasuke is able to reverse the process, absorbing Orochimaru and allowing him to put his plans of finding Itachi into motion. Sasuke forms Snake, a team of individuals assembled to aid him in finding Itachi. Once they are able to track Itachi down, Sasuke leaves his team behind and goes to kill his brother. When Itachi dies after a prolonged battle, Sasuke is collected by the second conspirator of the Uchiha massacre, Madara Uchiha. Madara tells Sasuke how Itachi killed the Uchiha under the orders of Konoha, spared Sasuke out of love, and subsequently allowed himself to be killed. Saddened with the revelation that his long-hated brother was a good person and as much a victim as the rest of their clan, Sasuke reunites with the members of Snake, renaming them "Hawk" as they set out to destroy Konoha. Login or register to add Sasuke-Kun as your friend!